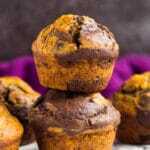 Pumpkin Chocolate Muffins – These deliciously moist pumpkin muffins are swirled with chocolate and perfectly spiced. Enjoy with your morning tea or coffee this autumn! It’s definitely my favourite season, because I get to enjoy everything pumpkin spice, Halloween, and a whole lotta scary movies. Aaand I get to bake up all the autumn treats and desserts. 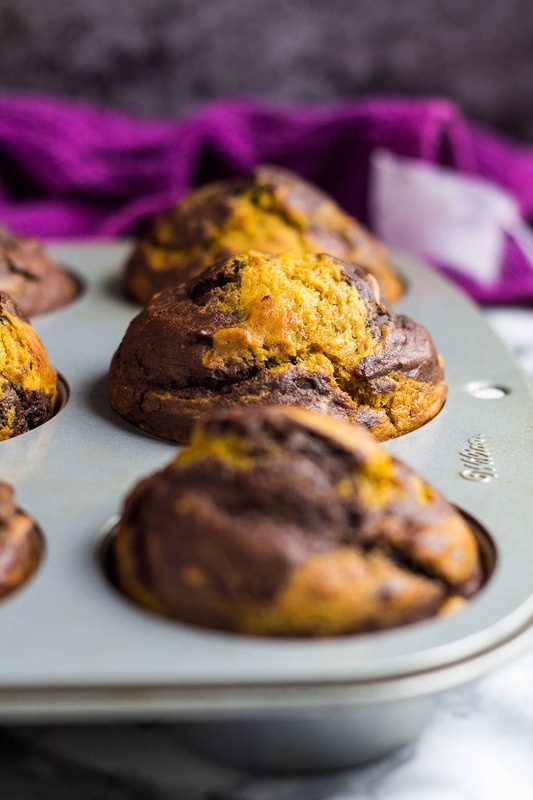 Today, I’m sharing one of my favourite pumpkin recipes – Pumpkin Chocolate Muffins! To make these muffins, whisk together the flour, sugar, baking soda, salt, and spices. Set aside. In a separate bowl, whisk together the eggs, vegetable oil, yogurt, pumpkin, and vanilla extract. Add the dry ingredients, and mix until just combined. Do not over-mix. Add half of the batter into a separate bowl, and fold in the cocoa powder. Alternating between the two batters, spoon into a greased muffin pan. Bake for 15 – 20 minutes, or until a toothpick inserted into the centre comes out clean. Allow to cool for 5 – 10 minutes in the pan, then transfer them to a wire rack to cool completely. 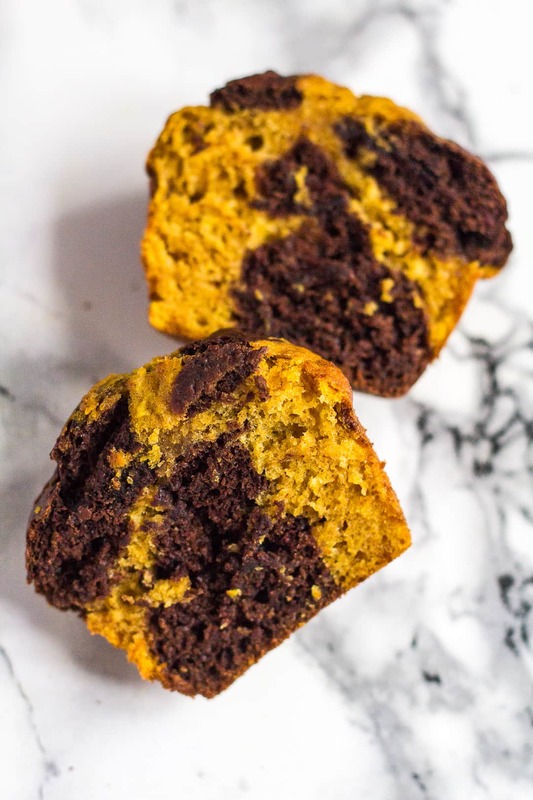 If you enjoyed my Pumpkin Bread and Pumpkin Streusel Muffins, you’ll love these muffins, because pumpkin and chocolate – what could be better?? I simply divided the pumpkin batter in half, and mixed a little cocoa powder in one, then I alternated spooning the two batters into a muffin pan. So simple, yet SO good! 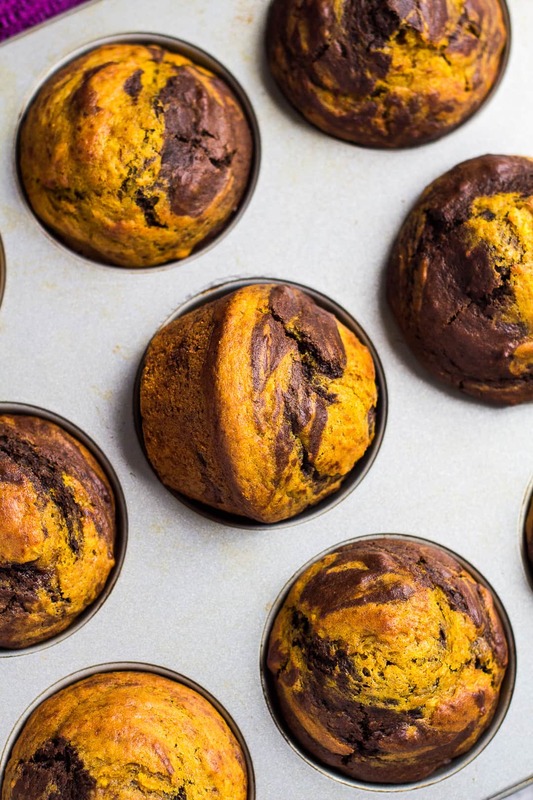 These deliciously moist pumpkin muffins are swirled with chocolate and perfectly spiced. Enjoy with your morning tea or coffee this autumn! Whisk together the flour, sugar, baking soda, salt, and spices. Set aside. Whisk together the eggs, oil, yogurt, pumpkin, and vanilla extract. Add the dry ingredients, and mix until just combined. Do not over-mix. Add half of the batter into a separate bowl, and mix in the cocoa powder. Alternating between the two batters, spoon into the prepared pan. Bake for 15 - 20 minutes, or until a toothpick inserted into the centre comes out clean. Allow to cool for 5 - 10 minutes in the pan, then transfer them to a wire rack to cool completely. Muffins stay fresh in an air-tight container at room temperature or in the fridge for up to 5 days. They also freeze well for up to 2 months. Thaw overnight in the fridge. These muffins look brilliant and I’d love to make them but I’ve read and re-read the recipe and I cannot see any pumpkin in the ingredient list, although it mentions it in the article. How much would you add please? Is it ok to make my own pumpkin puree by using a blender? These muffins look awesome! I love the colour combination and the flavour sounds delicious! I’m gonna have to agree with you on that one, Demeter. Love pumpkin and chocolate! 🙂 Thanks! Yeey for pumpkins!!! 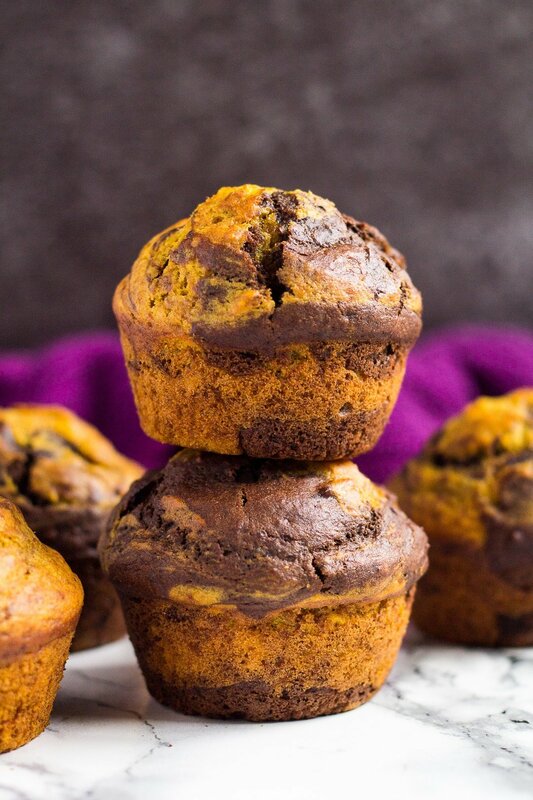 … and pumpkin chocolate muffins. These look sooo delicious Marsha. Was just wondering if the taste would be terribly altered if nutmeg were not added? I HATE nutmeg!! hello! i SO want to try these tomorrow i have verytjing in my baking pantry but QUESTION… i just moved to Utah – elevation 5500 feet. my baking has had to be altered more often than not. Any suggestions for this particular recipe? Can I use Gluten free all purpose flour? these look amazing and I want to make them tomorrow….have you tried the recipe with coconut oil? what do you think?